Unbeknownst to many, the Central Steam Plant has heated the University of Toronto's St. George Campus for a century. 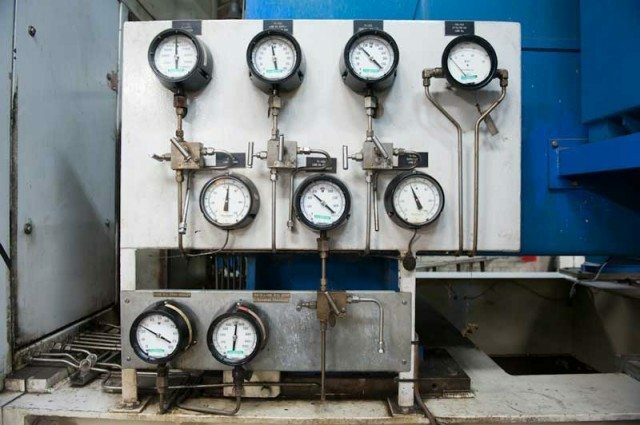 Numerous gauges measure pressure at various points inside the boiler system. Networks of catwalks with yellow railings allow workers to navigate around the machinery. These are the converters on the top floor. They turn steam back into hot water, which is then used for showers, or hot-water radiators. This is one of the older bits of the steam plant. The steel tank is sheathed in a layer of asbestos insulation. Thick, red cables carry 13,800 volts of electricity down from the top floor. The front side of a boiler with four injection ports for either natural gas or fuel oil. Numerous gauges display pressure readings in the lines. A crew of about ten people work at the plant, most of them contractors. The tunnels are forever being upgraded and repaired, as evidenced by the "danger" tape tied to this pipe. Heavy piping runs along the wall, delivering steam to the campus. The steam tunnels go deep underground. Through this small door, the tunnels continue. They become very narrow. A lone gas cyclinder stands against a support beam. Engines and valves can be seen everywhere throughout the plant. Tubes, pipes, and ducts run through the plant carrying hot steam. If you look up while walking through U of T’s St. George Campus, you might notice a towering smokestack looming high above you. The radial brick structure is part of the university’s Central Steam Plant, a 100-year-old facility that generates enough heat to warm almost 90 per cent of the buildings on campus. When you enter the industrial building at 17 Russell Street, the endless whir and hum of 300-horsepower engines and four-storey-tall steam boilers fills your ears. Each boiler pumps out as many as 200,000 pounds of steam per hour, through a complicated network of tubes. Foot-wide pipes rise from the floor and snake up to the ceiling. Catwalks, ladders, and stairways provide access. Standing on the top floor, you can look down through the grating and see all the way to the ground. This is not recommended for those with a fear of heights. Since it opened in 1912, the plant has undergone many upgrades. Relics from a past age are still present among the newer technology. Some pipes, still insulated with asbestos, are labelled and covered with plaster to contain the carcinogenic substance. The plant originally used coal-burning boilers, but in 1964 upgraded to cleaner oil- and gas-powered versions. The gas boilers have small access hatches in their sides. Every year, someone has to venture into their cavernous depths to look for corrosion and wear on the parts. It can be a dangerous job. Each time someone does it, there’s a rescue team on standby. Chief engineer Boon-Teak Lee has made the trek on several occasions. “It’s nothing,” he said, as he guided us through the plant. “[It’s] just a lot of steel. I’ve been crawling through them for so many years.” Lee started working at the plant in 1977 and became chief engineer in 1981. He opened one of the boiler hatches to show us the interior. Waves of heat blasted through the foot-wide viewing window. Inside, four enormous jets of flame blazed and roared furiously, the heat so intense it made the steel glow white hot in the circular openings where the fuel injects. The heat creates steam, which rises up to the fourth storey of the plant. From there, it travels throughout the U of T campus, where it heats many buildings. The exhaust gases from the turbine engines and boilers go to the heat-recovery unit, which reabsorbs some of the energy. This increases the operation’s overall fuel efficiency. On the day we were there, the plant was on track to burn 50,000 cubic meters of gas. Its gas bill reaches a staggering $1 million a month. In the control room, a small group of engineering students in hard hats took notes on the day’s operating conditions. Temperatures, flow rates, pressures, voltages, wattages, amperages, and clearance levels are all recorded in real time by the many sensors throughout the plant, and fed into computers, whose LCD monitors display schematics of the boiler systems and their current levels. The students took down the data for a project that involves comparing the plant’s real operating conditions to its ideal operating conditions. Opposite the computer workstations are cabinets containing controllers and transmitters for the process sensors. Every sensor in the boilers, pipes, and generators sends its signal to the controller, a small box that resembles a modem. If a level is too high or too low, the controller sends a signal that makes the proper adjustments to the system. After the control room, Lee led us into the steam tunnels. As soon as we stepped through the door, the sweltering heat overwhelmed us. It was like shuffling through a sweaty, noisy dungeon. The two-kilometre network of tunnels spans U of T’s entire downtown campus. Insulated piping carries the steam into the buildings. The tunnels reach deep into the earth, and at some points become so narrow only one person can go ahead at a time. A crew of workers spent three months down there, replacing old piping, but even just a few minutes in the muggy, 43-degree heat is enough time for a visitor to work up a sweat. At a century old, the plant may have another century of useful life ahead of it. When Lee reaches retirement in two years he’ll pass the chief engineer’s mantle to someone new.